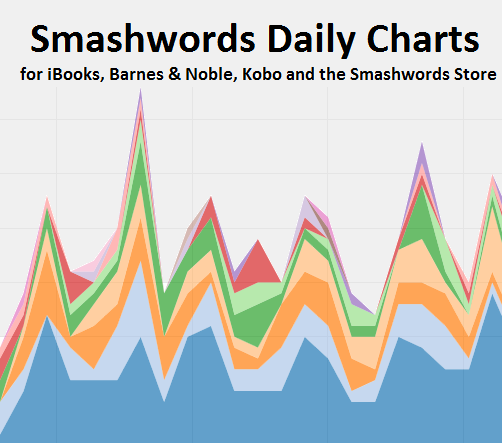 Smashwords today added daily sales reporting and interactive charting for sales at iBooks, Barnes & Noble, Kobo, OverDrive and the Smashwords store. The reports include daily and total order accumulation numbers for iBooks preorders. The reports provide authors and publishers unprecedented insight into recent sales performance across the largest Smashwords retailers. Authors can use the reports to gain rapid feedback on the effectiveness of marketing and promotion campaigns. You can view your aggregated performance over the prior seven day or 30 day period, with drill-down views by retailer, title or series. There are also one-click filters to view priced books, free books, all books and accumulated preorders (iBooks only). Publishers and literary agents who manage multiple authors can drill down and view author-specific performance. If you want to compare the performance of two or three series across different retailers, you can do it. If you want to measure the impact of a blog tour, an advertisement, a price change, a new cover image, a new release in a series or a new free series starter or anything else, the results are now at your fingertips. Each chart is also accompanied by a table that shows how the recent 7- or 30-day period compares to the prior 7- or 30-day period. Reports are updated same-day daily every three hours for Barnes & Noble; next-day daily for iBooks and Kobo; and same-day daily every 30 minutes for the Smashwords store. Sales data can be downloaded as a spreadsheet. Find the new charts in your Dashboard via the Daily Sales link. Learn more about daily charting in our Daily Reporting FAQ. What's coming next with Daily Sales: We'll continue to add more retailers to the daily charts as retailers make their data available to us. Also, in the months ahead as we begin archiving more daily trending data, and we'll add options for longer analysis periods such as 60 days, 90 days and longer. If you're uploading direct to any of our major retailers such as Barnes & Noble, iBooks or Kobo, consider consolidating your distribution with Smashwords. We help you spend more time writing and less time managing multiple upload platforms. By aggregating your sales analytics at Smashwords, we make it easier for you to spot trends, measure performance and adjust your marketing. If you want to change a price, or update your book description or upload a new cover, you do it once at Smashwords and we get it out to all our retailer and library partners. All Smashwords authors enjoy centralized pricing and metadata management, aggregrated sales reporting, exclusive sales and merchandising tools, access to a growing network of retail and library sales channels, and consolidated payments and year-end tax reporting. At Smashwords, we're always working to bring you the tools, distribution and knowledge that will give your books a competitive advantage in the marketplace. Smashwords Daily Reports joins other powerful tools at Smashwords including Smashwords Coupon Manager (custom coupon codes), Preorder Distribution (preorder listings at iBooks, B&N and Kobo), Smashwords Series Manager (enhanced series discoverability), Pricing Manager (centralized pricing control and custom library pricing), Smashwords Interviews (fun self-inteviewing tool helps readers learn the story behind the author). More tools are coming! Click here to learn how to publish and distribute with Smashwords. Kudos to Case Talbot on the Smashwords engineering team for leading this exciting project. She's also the engineer behind Smashwords Interviews, Dropbox integration and the responsive website redesign. Thanks also to the rest of the Smashwords engineering team who assisted her, and thanks to our beta testers who provided us wonderful feedback on this feature. Great addition and one which has been needed for some time. Congratulations to Mark and the software engineers for making Smashwords the best ebook distributor for authors. No doubt you've got some good engineers/programmers with you and my hat is off to each one..
Mark, wonderful addition to Smashwords and thrilled to have been able to be a Beta tester! Thank you. As a frequent publisher at Smashwords, I at last know where my books have recently been, so I also know where they are headed. This will be a valuable tool for marketing. Thanks so much for this feature, Mark and Case! One more reason to publish with Smashwords. A great addition to our tools, thanks for the hard work of your entire team. Could your engineers possibly add International Mystery and Crime to your categories? Am esp surprised and pleased OverDrive is already included. Look fwd to seeing Oyster & Scribd. With the latter two, maybe the full royalty triggered reads could be daily, and partials held til eom to see if any convert to full reads. All in all, a big big plus for Smashwords! Love it. The evolution of Smashwords gets better all the time. This is very exciting! Doing way better on one book than I thought. Thanks for your hard work for authors. Thank you! You just got better than Amazon's new reporting chart by letting us see all the channels at once while Amazon can show every channel or each channel one at a time. One question though: I see there's a button to remove a book from the comparison. Is that for that session or is it a persistent setting? Thanks for the kind words. In answer to your question, the remove button only removes for this page view. If you reload the page, it will again load the top 15 books/authors/series. I love this! Big thanks to Mark and team. OMG "Smashwords gets more and more awesome!" Thanks for the new feature...daily sales help out so much. The page doesn't seem to work in any Webkit-based browser I tried (Chromium and a couple of more obscure browsers) at least on Linux. It just displayed a small black box where graph should have been. Google Chrome and Safari (~50% of web users between them) are both Webkit-based, so you might want to have a look into this. There's no "Free" sales listed on the daily list from any vendor other than Barnes and Nobles for me, so I was curious as to whether that's an accurate reflection, or are they just not reporting it from other vendors? Also there was no Free sales from Smashwords even, and the dashboard lists something like 15-25 downloads in the last 30 days. What's the difference between the reporting of the two? IE9+ on Windows, Chrome and Firefox on Windows, OSX, and Linux, Safari on OSX and iOS, as well as Chrome on iOS and Android. We aim for a responsive UI on mobile platforms when possible. I also just checked in Chromium and Epiphany on Linux and both work as expected. I tested on Ubuntu 14.04. This project does use d3 with svg support as our primary graphing mechanism. Perhaps your distribution (or some other installed package) broke support for SVG for you? With regards to free sales, check the /reporting/info page for details. Also, reporting on free downloads at Smashwords is new as of last weekend, due to some extra triaging we wanted to do to exclude "sales" that were really downloads from users who had purchased your book already. This made our "free downloads" used in this reporting tool more equatable with the free downloads reported by our retail partners. @Case Talbot, you're correct. My apologies. For anyone else who has a problem I had to install the 32-bit compatibility package for librsvg and restart my browser (I'm on 64-bit multilib). You people at Smashwords are truly writers friendly! Thank you very much for all the good things you are doing for us! Keep it coming. Great stuff this year. I luv it! Thanks a bunch to you all! This is great! Though as someone already mentioned about free book reporting... Kobo has not registered as my having given away a free story/book in YEARS. (yes, I recently went through and redid my spreadsheets and noticed this. I have free book data through August 2011 (where it was an average of 60 or so a month) and then it dropped to zero and has stayed that way since. I'm not hugely concerned or I'd have filed a ticket, but it is something you might want to look into since you're obviously tweaking data coming from distributors because I may not be the only one. Of course there is a chance that I am giving absolutely nothing away there, but it seems odd that it dropped off to 0 like that across all the titles and stayed that way ever since. Even places I have bad sales at have one now and then. Thank you Smashwords for the new Daily Sales report. We love it. Now we have a better idea of how our books are selling in real time. It cheers us up and makes us motivated to keep on writing books together. Thank you from the husband and wife writing team of Louise Hathaway. @Joleene: sorry about the typo in your name! My apologies. Helen, yes definitely. We works with thousands of Aussie authors. We pay though PayPal. When you sign up for an account the confirmation email will walk you through next steps.